A tower started about 1170 with extraordinary detail stands by the south transept of a C13 church, little altered since, with fine work probably related to Chichester cathedral. The church stands in flat countryside near Ford open prison, a former naval air base. Two churches are listed in Domesday Book (11, 75-76), but the second, at Cudlow, was lost to the sea. Its last incumbent was appointed in 1546 (VCH 5(1) p146) and there is no record after 1698. There was a third church at a later date at Ilsham in the centre of the parish, which had probably gone by the early C16 (ibid). 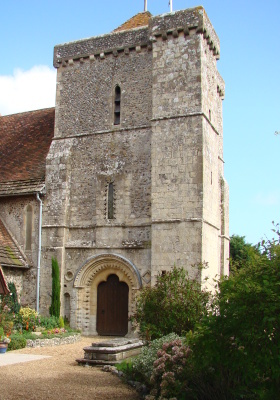 Of Climping church, the earliest part to survive is the tower of c1170-80, which is attached to the later south transept. An earlier roofline on its north side suggests it stood in a similar position relative to the previous church. Peat and Halsted (p64) suggest this could have been pre-Conquest, but give no reason. The tower has clasping buttresses at three corners and a stair-turret at the fourth. It resembles no other in Sussex, particularly the weathered west doorway. Its roll-moulded round head has dogtooth on the label (a good indicator of the date), but the plain opening is trefoiled and surrounded by deeply cut continuous chevrons, which extend to the jambs. There are no capitals, just thin bands, too slight to be full abaci, and the opening of the doorway is rounded. A small blank roundel to the north, balanced on the other side by a lozenge, shows more dogtooth; both may be unfinished (Roberts p173). A narrow plain and rounded niche under each extends to ground level. 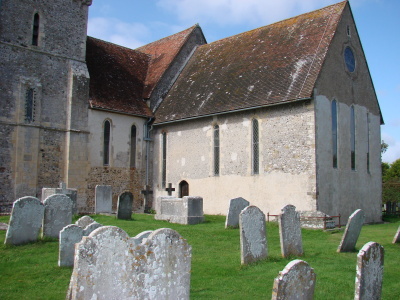 At Climping, the second stage has further unusual features, for in the centre of each side is a further shallow projection like a pilaster or buttress, but without any structural function (ibid p171). Each contains a single roll-moulded lancet, but these are barely recognisable as such, for they are entirely surrounded by more deeply cut chevrons. The head of the west one is restored, as is evident from Horsfield’s plate (II p213). The detail of the more conventional third stage, lancets, a plain parapet, a corbel-table and a tiled pyramid, suggests it was completed rather later, perhaps after 1200. The arch from the tower into the south transept has slightly responds with a slightly bowed cross-section; though the head is pointed, its two plain orders are compatible with a date around 1170 for the lower part. The antecedents of the tower are puzzling. Though less fantastical, the doorway shares a sense of drama with the nearly contemporary arcades at Steyning, notably the deeply cut mouldings. There are parallels with the portals of some French churches linked to the Cluniacs (see J Evans figs 212-18), some of them early C12 at the latest. Yet Climping had no known links with the Cluniacs. Lewes priory, their main house in England, was near enough to be an influence, though it is not known if there was such work there. 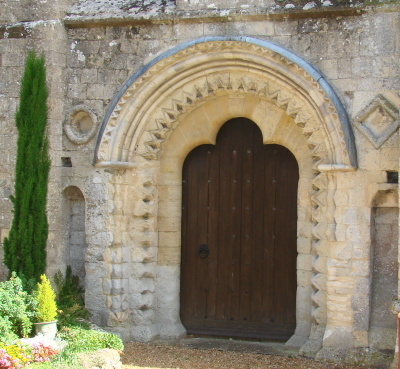 The closest parallel in England to the doorway is the north one of much the same date at Bibury, Gloucestershire, which has more conventional abaci and though the head has three lobes, the opening itself is not rounded off. It is difficult to conceive that there could be any direct link beyond the fact that they were contemporary and dated from a time when the conventions of the romanesque were increasingly being challenged. The body of the church has a cruciform plan with lancets throughout and was probably started soon after the top of the tower was finished. The circumstances of its building can be surmised. John de Clymping, a canon of Chichester and Bishop from 1253 to 1262, held the living in plurality from 1220 (VCH 5(1) p145) and work may have started soon after. By contrast with the tower, it is quietly assured and, unsurprisingly, has affinities with C13 work at Chichester cathedral. Work started with the chancel, as the preponderance of early C13 features shows. 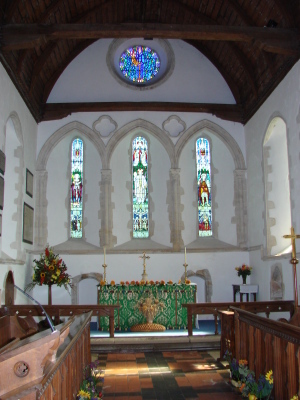 The lancets are roll-moulded inside and out, including lowsides both sides, and the chancel arch has square responds with slender shafts at the angles and a head of two orders, the inner on conical corbels. The finest work is on the east wall in which there are three spaced tall lancets (the north one is slightly narrower) and a roundel above. The shafted rere-arches have stiff-leaf capitals and between the simply moulded heads are plain quatrefoils. This sounds modest, but the proportions show the C13 English preference for line over ornament at its finest. The transepts followed. The lancets are still tall and slender and those to the north have a roundel above. 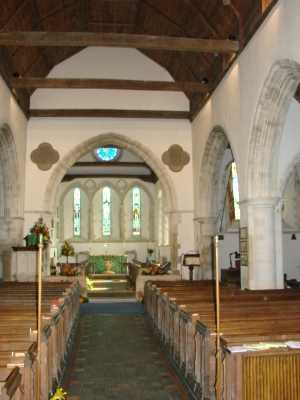 The complex mouldings on the inner orders on the heads of the arches facing into the body of the church are later than the chancel arch; the outer ones are hollow-chamfered. Fluted corbels on the responds of the smaller north arch support the inner order. Though the nave has only a south aisle, the long lancets to the north show there was no intention of rectifying the asymmetry. The west lancets are even taller, beneath a large octofoil. 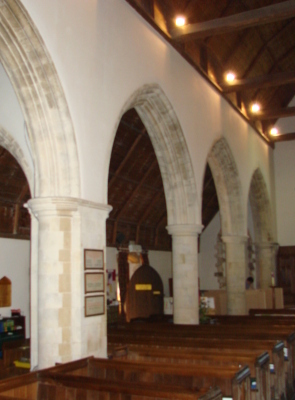 The arcade resembles the transept arches, with round piers and responds on high, spurred bases. Though plainer, the arch from the aisle into the south transept is similar and the west doorway is renewed for Adelaide Tracy (II, p69) shows it blocked. Visible later changes were few. Horsfield and Nibbs (c1851) show a large south porch, which looks C15 and was replaced in the C19, and on the Sharpe Collection drawing (1804) the chancel roof had a lower pitch, which has been rectified. G M Hills was the restorer in 1874-75 (B 33 p650). At his worst, he could virtually rebuild a church, but here he took more care, whilst doing more than is apparent, as the budget of £2300 (KD 1899) indicates. Most obvious inside are the boarded roofs, though he retained most roof-timbers, which are probably C13. Externally, as well as replacing the south porch and west doorway, he rebuilt much of the west wall, though within a few years subsidence was again a problem (CDG 1 (1894) p15). Hills also rebuilt the upper part of the tower (B ibid) without change. 1. (East wall of the chancel) Two arched ones, contemporary with the fabric. 2. (Chancel north wall) C13 trefoil-headed. Benches: (Front of nave) C15 traceried bench-ends. Chest: (Formerly in north transept, now at Chichester cathedral) Large C13. It has trefoiled arcading on the front and elaborate rosettes at either end. Font: Retooled C15. It has an octagonal bowl with quatrefoils on the bowl and an arcaded stem. 1. (Three north nave lancets) (2) F Holt of Warwick, 1891 (BN 61 p251), (1) 1898 (B 74 p572) and (3) 1910 (signed). 2. (South transept east windows) 1892 by Bell and Davidson of London (Peat and Halsted p74). 3. (East window) J Powell and Sons, 1920 designed by E Penwarden and G W Read (Hadley list). 4. (North transept, two north and two east windows) J Powell and Sons, 1926 (Designed by A F Erridge), 1926 and 1928 (designed by G W Read) (all ibid). These are all related in design with small figures in panels, set in plain glass. 5. (South aisle, first window) M Minter, 1931 (NADFAS). A small figure, simply drawn. 6. (East roundel) J Baker, 1960 (ibid). A stylised madonna and child. 7. (South aisle, second window) D Wasley, 1993 (ibid). brightly coloured with drawing that recalls the glass of Marc Chagall. Image bracket: (South transept) Its presence may indicate the transept was a Lady Chapel. Mosaics: Mosaics by J Powell and Sons, designed by —- Miller and dating from 1923 (Hadley list) cannot now be identified. 1. (In tower) Remains of a circular consecration cross which may date back to the period of construction. 2. (North transept) H Hardy, 1920s. Mostly scenes from the Bible in local settings. In one Christ receives a mixed group of the middle classes of the day, including boy scouts. The artist spent much of the last years of his life working on them (Mee p102) and three were the artist’s gift to the church on its 700th anniversary, as the incumbent was a friend (Stewart and Cutten (not paginated)), and they were originally in the chancel (VCH ibid). Piscina: (Chancel south wall) C13 trefoil-headed and roll-moulded. 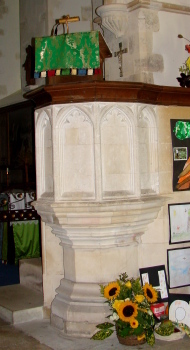 Pulpit: C14 or C15 of stone and modelled on a wooden one, its sides decorated with trefoiled and cinquefoiled panels. 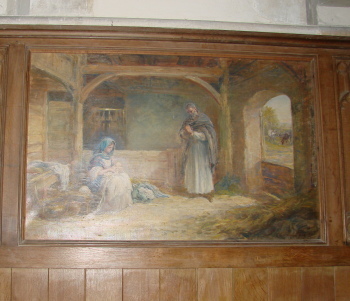 It was moved and altered at the restoration.